by [with] your leave ご免をこうむって, 失礼ですが. Don't go without (my) leave. (私の)許可なしで行くな. You have my leave to go home. (私が許しますから)家に帰ってもよろしい. He asked leave to adopt the boy as his son. 彼はその少年を養子にさせてほしいと願い出た. ask for leave (of absence) 休暇を願い出る. 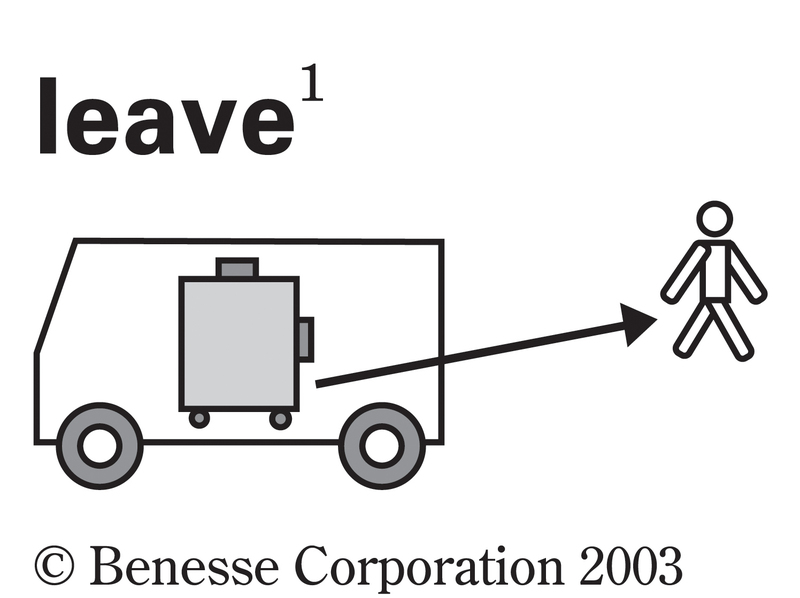 take (a) six months' leave＝take (a) leave of absence for six months 6か月の休暇を取る. We have two leaves a year. 休暇が年に 2 回ある. ・ She is currently on leave. ・ She leaves home for school at 8:30. ・ He departed for Russia. He left his home at 8:00 a.m. I left the town on my right and went up the hill. 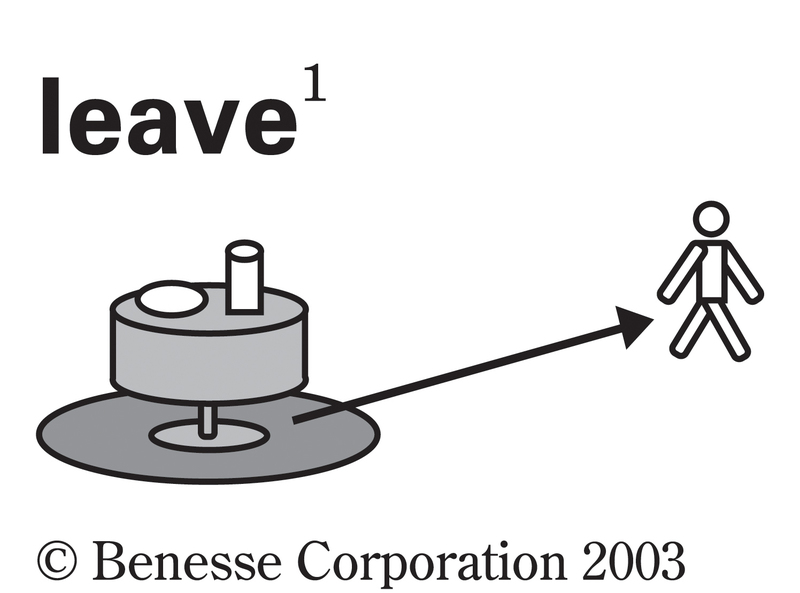 May I leave the class? My secretary left me for a new company. She left her husband for a rich lawyer. I have two more pages left until I finish the chapter. We left our son at home with two friends. I left a note for my daughter. In Japan people leave their shoes at the front door before they enter the house. She left her suitcase on the bus. He left his only son. My aunt left me her silver spoon collection. Let's leave this work for another day. The spilled coffee left a stain on his white shirt. Louis Armstrong left an everlasting mark on jazz music. She always leaves the snow shoveling to her husband. Let's leave everything to fate. I'm leaving all up to you; you decide what you want to do. He was left with no choice but to give up hope of going to college. You should leave him to draw his own conclusion. I decided to leave him to his work. She left Sam to his melancholy. He always leaves his room untidy. I left the door unlocked when I went out. Don't leave the computer on when you go out. The murder left the whole town wondering who the criminal might be. Are you leaving so soon? I'm afraid I must be leaving now. Leave aside, for a moment, the question of who's right. When I arrived at the airport, he realized he had left his ticket behind. I left my family behind when I went to work in Indonesia. I was left behind in geometry after I missed three classes. She left all the other marathon runners far behind her. The rooster has finally left off crowing. I left him off the list. He left Joan out of his plans. There was a lot of food left over after the party. The scenery is beautiful and unearthly. Leave it as it is. Leave her be and she'll come back on her own. He's in a bad mood, so you'd better leave him to himself. His conversation wasn't exactly scintillating, so she left him to it. Just leave well enough alone and they'll solve their own problems. 成句To be left until called for. The letter was sealed in an envelope, to be left until called for. He took a week's leave to visit his sick mother. Let's get married before my leave is up. Johnson was given leave to borrow the company car. I will be on leave from 5―13 Jan. Sorry but I have to take leave of you. Hurry! We have to leave in a few minutes. Did they leave for the airport on time? I'm afraid I must be leaving [going] now. He went to college as a freshman and left without saying goodbye. leave Tokyo for New York. We left our son at home with two friends and a pizza. My father's will left me all of his property. She left her suitcase on the bus, but fortunately, someone turned it in. My aunt left me her silver spoon collection when she died. His defiance left the governement with no choice but to arrest him. He was left no other option than to become an outlaw. I'll leave you to finish your dinner. I'll do my job and leave you to do our own. He's left his job as a programmer and become a gardener. Don't leave this problem for tomorrow; take care of it today. We must leave this problem aside. When he arrived at the airport, he realized he had left his ticket behind. Should I tone down my criticism or leave it in? Go back where you left off in the document. He left off his narration just before the climax to the story. The snow has finally left off falling. His statistics made it impossible for me to leave him off this list. When in doubt about a comma, leave it out. The Smiths were left out of the wedding invitations. He left Joan out his plans. He did not leave over a portion of the food from his plate. Go away and leave me alone! I don't want to see you again. Mind your own business! Leave him be! His conversation wasn't exactly scintilating, so she left him to it. Nothing you can say will make me decide to stay. Just leave go of me. We've finished chapter 11, class. Let's leave it at that and call it a day. We've left no stone unturned in trying to make this home page easy to use. When it came to manipulating the machine you left him standing. My report cards always included the comment, "His comportment leaves much to be desired." "How much?" "I'll leave that to you." If you leave him to his own devices, he'll do just fine. He left word with a friend he could not trust, though. Leave word for her that she has a new mentor. Come on, it's time we left. In mechanical polishing, thinning process is more reproducible than chemical polishing and hence the machine may be started and then left alone until thinning is almost complete. The effect of a demagnifying lens is to increase the current density J and the angular aperture α, thus the brightness is left constant. Electrons that leave the tip possess a Maxwellian distribution of velocities, including radial velocity components. In thick specimens, the electrons are strongly scattered and leave the specimen in a broad cone. From Middle English leven, from 古期英語 lǣfan (“to leave”), from Proto-Germanic *laibijaną (“to let stay, leave”), causative of *lībaną (“to stay, remain”), from Proto-Indo-European *leyp- (“to stick, fat”). Cognate with Old Frisian lēva (“to leave”), Old Saxon lēvian, Old High German leiban (“to leave”), Old Norse leifa (“leave over”) (whence Icelandic leifa (“to leave food uneaten”)), lifna (“to be left”) (whence Danish levne). More at lave, belive. 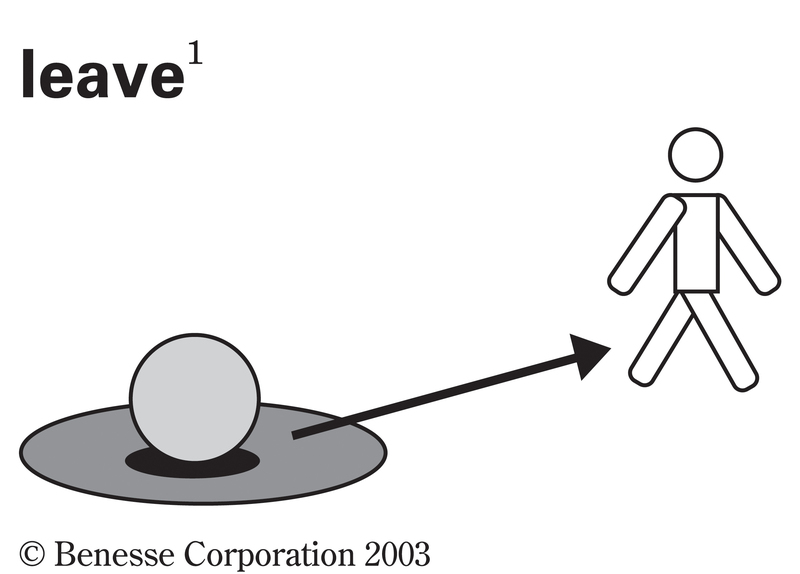 (billiards) The arrangement of balls in play that remains after a shot is made (which determines whether the next shooter — who may be either the same player, または an opponent — has good options, または only poor ones). From Middle English leve, from 古期英語 lēaf (“permission, privilege”), from Proto-Germanic *laubō, *laubą (“permission, privilege, favour, worth”), from Proto-Indo-European *lewbʰ- (“to love, hold dear”). Cognate with obsolete German Laube (“permission”), Swedish lov (“permission”), Icelandic leyfi (“permission”). Related to Dutch verlof, German Erlaubnis. See also love. From Middle English leven, from 古期英語 līefan (“to allow, grant, concede; believe, trust, confide in”), from Proto-Germanic *laubijaną (“to allow, praise”), from Proto-Indo-European *lewbʰ- (“to love, hold dear”). Cognate with German lauben (“to allow, believe”), Icelandic leyfa (“to allow”). 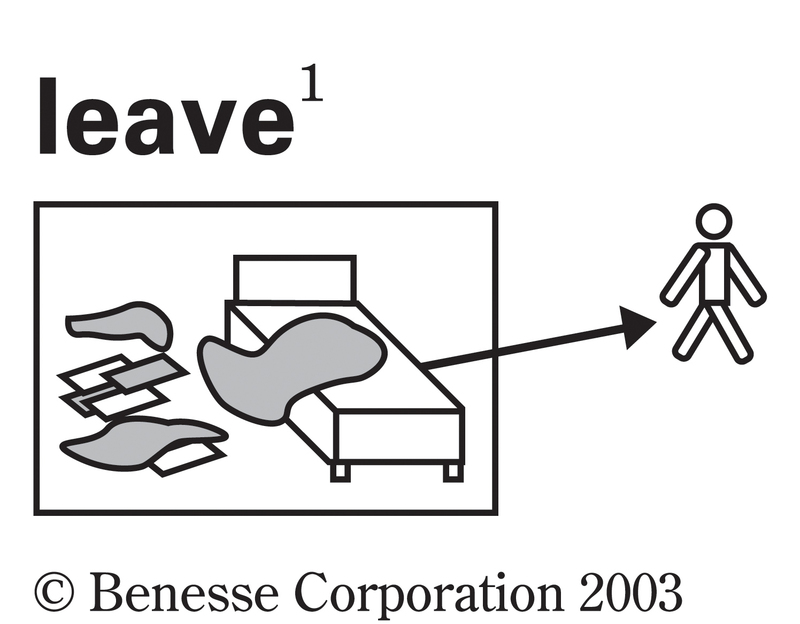 (intransitive, まれに) To produce leaves or foliage.